Expect this to be the first of many food posts for Florence, and Italy in general, because you know I love my coffee/tea, gelato, and great food. We've explored both on and off the beaten foodie path (and still have lots to go), but these are the places that I'm loving so far. And now that the weather is giving a taste of fall, I'm looking forward to celebrating the fall harvest with delicious wines, farmers markets, food festivals, and restaurants inspired by Tuscany's freshly harvested produce. I've eaten at Foody Farm three times now and each time, the food and service has been really wonderful. I've tried so many different meals and snacks and haven't been disappointed yet. I'm even a bit torn between favorite dishes: both the chicken fingers and the ravioli are amazing. As silly as it sounds recommending chicken fingers at a Tuscan restaurant, the tender strips of chicken are coated in spices and come with an amazing cheese dipping sauce. The falafels are really moist and flavorful, and probably what I'll order the next time we dine here. Also, try some of the cheeses from their flavorful selection. I've tried the first three on the menu and they are really creamy and served with honey and a really powerful pear jelly. Another bonus about Foody Farm is that they are open and serving food all day -- when most restaurants are closed -- making it a perfect option for parents dining with kids. If you want to read more about Food Farm, see my full review here. Mercato Centrale in Florence features a large market with meat, fruit, and vegetable sellers on the bottom floor and different food stalls on the top floor. The food stalls are a great place to stop by for a snack or meal, especially if you don't want to wait until other restaurants open around 1 or 1:30 pm. Here, you'll find a Sicilian snack seller, a great pizza place, a bar, and a decent dumpling spot. We stopped at Zoe with my in-laws for a quick and very tasty lunch. The salads are massive, larger than my head, and come packed with goodness. I had chicken, bacon, and loads of vegetables. Zoe is right next to the Bardini too, which makes it a great spot for a post-museum meal. You can find Zoe on Via dei Renai, 13, 50125 Firenze FI. Located right along the northern side of the Arno, Moe 5 and Mo Lo are awesome outdoor spots to eat that sort of remind me of my beloved Open Kitchen in Vilnius. Moe 5 has a large outdoor seating area and food stands including restaurants serving fish and chips, burgers, and pulled pork, as well as a bar and gelato cart. Moe 5 is more geared towards families and offers a changing table, tire pump for bikes, and high chairs. It is also very near a large playground, which makes it great for an after playground meal, especially since Moe 5 is open from 1 pm on. Mo Lo is only open for dinner from about 7 pm on and has a more adult atmosphere. The tables and chairs are a little bit nicer, the bar is a lot larger, and there is often a DJ. Mo Lo has stalls selling Japanese food, vegan food, a pizza stand (which is really good), a seafood stand, and a tasty Tuscan food stall. I'd recommend the Tuscan food stall and the pizza stand. The wine options at Mo Lo are also spot on and the staff are very friendly. This awesome hipster, off-beat bakery answers my desires for a cool, somewhat different hangout compared to the abundance of sandwich spots around the city. S.Forno has tasty, light options for lunch, craft juices and sodas, and a small section of pantry items that would make great gifts or souvenirs. I visited S.Forno while my sister was here, so I got to taste a bunch of different options including a really tasty spinach salad (see photo below), mini pizzas, and fig, cheese, and prosciutto on foccacia. If you are looking for somewhere a bit different, yet delicious, with in-season produce and tasty cured meats, S.Forno is the place to go. S.Forno can be found on Via Santa Monaca, 3r, 50124 Firenze FI. I'm so happy that it is September, so that I can now enjoy Bottega di Pasticceria again since they were closed all of September (a tradition in Italy). Though this cafe and bakery looks really fancy from the outside, don't let that put you off because their pastries are so delicious, their staff very nice, and their prices are surprisingly low. 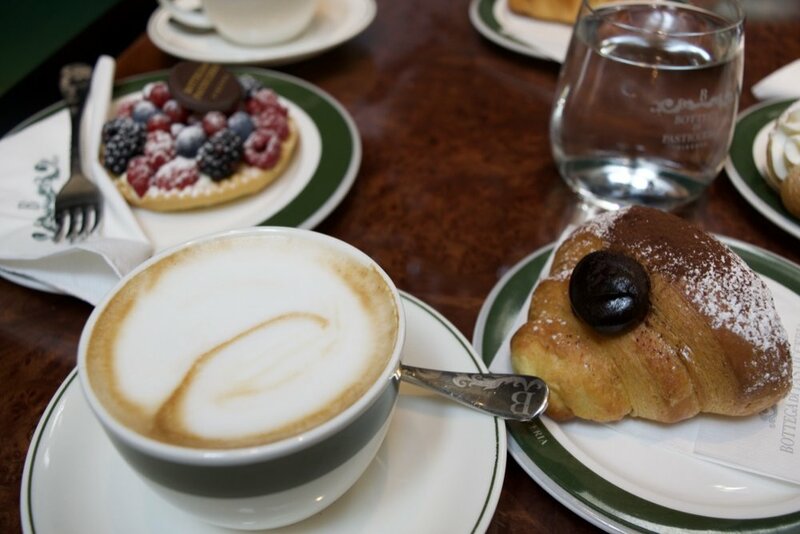 Bottega di Pasticceria offers a selection of mini pastries that seem to vary day to day, and a large selection of normal sized pastries like croissants, sandwiches, and mini pies. They also have delicious cappuccinos and espressos. Unlike what seems to be the vast majority of cafes in Florence, Bottega offers free Wi-Fi and it seems to be completely fine to park it with your computer to catch up on work. I've not worked at any cafe yet in Florence, but I'll fill you in on my favorites for working soon enough! During meal times, Bottega di Pasticceria turns into a restaurant and serves wine, but I've not tried their meals (yet), so I can't comment. You can find Bottega at Lungarno Francesco Ferrucci, 9c Rosso, 50126 Firenze FI, Italy. I only just tried Caffetteria Piansa last week, but I liked it so much that I know I'll return soon. Caffetteria Piansa has a great selection of tasty croissants with various fruit and chocolate fillings; I tried the croissant filled with apricot jam and it was so tasty. The espresso I had was also very nice, but what stood out to me was the chill atmosphere and selection of their own beans and a variety of coffee making equipment. Most cafes only seem to offer espresso-based drinks, but Caffetteria Piansa also has Aeropress and Chemex coffee available. You can find Caffetteria Piansa at Via Vincenzo Gioberti, 51/red, 50121 Firenze FI, Italy. Gelateria Neri is so good. Located in a heavily trafficked part of the city, Gelateria Neri has smooth gelato with a variety of delicious, bold flavors. Our favorites here are the mint, salted caramel, and chocolate made with brown sugar. You can find Gelateria Neri on Via dei Neri, 9/11, 50122 Firenze FI. It is near Foody Farm and is next door to a gluten free bakery. As good as Gelateria Neri is, I think Gelateria Sorrento is my favorite so far. Definitely outside of the tourist part of the city, Gelateria Sorrento is a hidden gem with delicious flavors and a very friendly staff who will most likely remember you after your first or second visit. If you are a chocolate lover, I have to recommend their dark chocolate, which is absolutely amazing. I also really like their other flavors, which do seem to vary depending on the season (now they have fresh fig and peanut butter). If you are vegan or lactose-free and love ice cream, you'll also be happy to hear that Gelateria Sorriso has a very large selection of vegan gelato, which I've actually ordered by accident, but tastes very similar to the gelato made with milk. You can find Gelateria Sorriso on Via Erbosa, 70, 50126 Firenze FI. Il Procopio is another gelato spot that I've tried multiple times and loved. The flavors here are very unique and include Sachertorte, chocolate fondant, and one loaded with dried fruits and nuts. Every flavor I've tried has been delicious but my favorites are Sachertoret and chocolate fondant -- clearly I'm a chocolate lover. Il Procopio is located on Via Pietra Piana, 60/red, 50122 Firenze FI. Have you eaten at any of these spots? 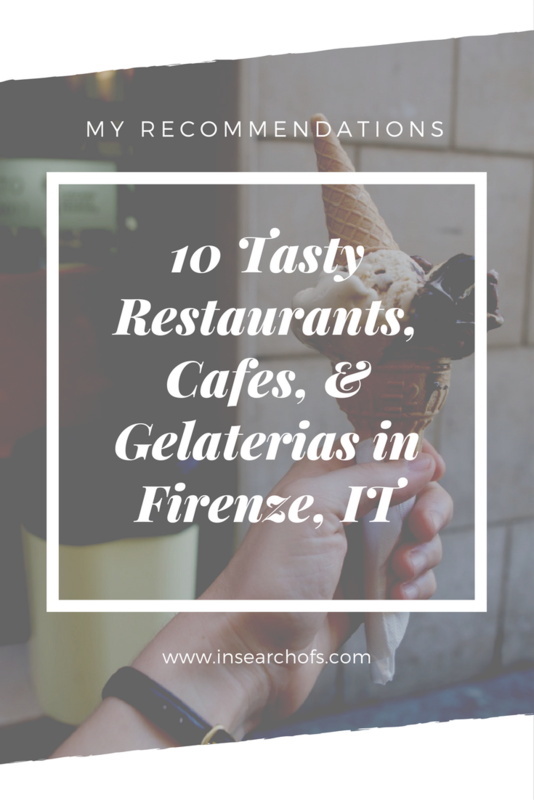 What other restaurants, cafes, or gelaterias do I need to try in Florence? I'm always looking for some good suggestions!